Interesting quote of a quote from Will Richardson. I guess that makes my post a quote of a quote of a quote. Anyway, this piece of the quote describes what institutions must do to be successful during this economic crisis. Are your faculty, technology officers and administrators talking, collaborating, etc, or are they all working in silos? Maybe it's time to bring them together. institutions were agile enough to make a difference by bringing the wisdom of their scholars together with the acumen of their technology officers and the ingenuity and determination of their university leaders. Everything you do now ends up in your permanent record. The best plan is to overload Google with a long tail of good stuff and to always act as if you're on Candid Camera, because you are. Wow - scary stuff, especially when you combine with information like this! The emphasis is mine. I work as a credit analyst for a big bank. I work in a call center and take calls from people who would like to lower their interest rates or increase their credit card limits. Yesterday, I talked to a man in California who for the past five years worked as a 'sandwich artist' at Subway. His salary--and his only source of income? $18,000 per year. His recently foreclosed mortgage? $380,000. The mortgage was individual, meaning no one else was legally or, more importantly, financially responsible for it. He had no down payment for the mortgage. The down payment was an additional $70,000 mortgage loan, also foreclosed. I assume he had someone living with him, who was able to help with the interest-only payments at least for a while until they reset to include the principal. But in the end he was given a total mortgage 25 times his income with no down payment. Did he lie about his income and not provide documentation? Possibly. But the man was immediately frank with me about how much he made and what he did for a living. So assuming he was honest with the mortgage lender--who gave him the loan--as he was with me, their recklessness and greed become clear. Ed Yourdon has updated his "Using Twitter in the Enterprise" presentation. I've embedded the sldeshare version below.Updated “Using Twitter in the Enterprise” - The Yourdon Report - Blogging the impact of computer-related technology trends, and whatever else catches my interest. : "I’ve updated the material that I used for a Webinar presentation on ‘Using Twitter in the Enterprise’ for the IT Metrics and Productivity Institute a few days ago; I think this new version is better organized, and it has some new material.You can download the 5.6-megabyte PDF file by clicking here; you can also view the presentation (with or without downloading it, as you please) on Slideshare by clicking here. Here's Twitter co-founder Evan Williams TED talk, which was mentioned here. As a presenter, the idea of presenting while people are talking about you is disconcerting. But to balance that, there are huge benefits to the individual members of the audience and to the overall output of a conference or meeting. The more I’m allowed to interact and play with the content the more engaged and ultimately the more learning happens. The more the presentation relies on the back channel, the more I focus. Knowing that my comments are going to be seen by the presenter or live participants, seems to make me pay more attention. Twitter allows me to add my perspective to what is being presented and that keeps me more engaged than just sitting and listening - even if no one reads it. The full essay appears on Pistachio Consulting's blog, and comes from New Zealand-based speaker coach Olivia Mitchell. Very sad video detailing the demise of the Rocky Mountain News. Great Charlie Rose interview with Amazon's Jeff Bezos. He won't give up how many Kindles they've sold, but still a really interesting interview. Some details on the upcoming Evolution R-1 Pico Projector from Beambox. I love that it has 4GB of memory and a microSD slot. Throw some of your best presentation videos on there and hit the road! You want one don't you? Great for that elevator speech you've been waiting to give to your company/college president. The R-1 will boast an LCoS chip, a brightness of 30 lumens, with a 200:1 contrast ratio and VGA (640 x 480) resolution, and will be capable of projecting an up to 100-inch image. The little guy will also have up to 4GB of onboard Flash memory, plus a microSD slot. The pico -- which weighs in at 175 grams -- is expected to ship around March 20th. It looks like the projector is going to run you £250 ($360), and be available in black, red, silver and white. Some very cool artwork linked to from the Digital Crushes blog. Modern Mantra is a series of 18 pen-and-ink drawings by swedish artist Thomas Broome. Using typography he manages to construct highly detailed room interiors. The technique seems simple: by repeating the name of what he is drawing he forms the shape of each item. The catch is how to make it look realistic, which can only be done with a precise use of proportions and perspective. How to Measure Broadband Connectivity? It’s certainly true that in some countries, like South Korea, far more homes have broadband connections than in the United States. And the speeds in some countries are far higher than is typical here. But there are many ways to measure the bandwidth wealth of nations. At the Columbia/Georgetown seminar on the broadband stimulus yesterday, I heard Leonard Waverman, the dean of the Haskayne School of Business at the University of Calgary, describe a measure he developed called the ‘Connectivity Scorecard.’ It’s meant to compare countries on the extent that consumers, businesses and government put communication technology to economically productive use. If you've been suffering from iPhone-envy, but were stuck with a carrier other than AT&T - this might be the news you've been waiting for. Unfortunately it's only a rumor at this point, but a glimmer of hope is better than no hope at all. Apple To Launch iPhone On Verizon Wireless? So, this is a pretty sketchy report, but fascinating if right. A Rome-based reporter for the Bangalore-based tech news site ITExaminer.com is reporting that ‘deep throats’ at Apple (AAPL) say ‘iPhones for Verizon Wireless (VZ, VOD) will be announced soon.’ Of course, the iPhone until now been available in the U.S. only via AT&T (T). If the report is true, Apple would gain access to many additional potential new customers; this would obviously be good for Verizon Wireless, not so good for AT&T. While the deal is so secret that Apple will not even hint that it is happening, the outfit had been trying to find EVDO and CDMA Engineers for months in their online iPhone job postings. While EVDO could cover a wide range of 3G skills, it is more likely that Apple is specifically after the Verizon Wireless standard. James G. Ennis, chair of the committee and sociology professor, said that the past year has seen much debate among the faculty about the transfer value of AP credits. He said many faculty members have questioned whether the substance of an AP test can truly replicate the value of face-to-face coursework at Tufts. In other words, it's not enough to have a nationally normed standardized achievement test measuring a student's content knowledge in one of the 30 subjects now offered. No, a better way to ensure quality would be to have different Tufts faculty teach their own versions of the courses to small to medium sized classes, administer their own examinations, and submit their own subjective grades. And students can have access to this Tufts brand all for the low, low price of two annual payments of $25,700. Or they could pick the version that's standardized across the country, that's graded rigorously against thousands of their peers, and which costs students exactly $86. Is the decision about quality, or is it about the Tufts brand? You know there are significant economic problems when Harvard—an institution known for having the largest foundation endowment in the US world–starts looking for ways to cut back. I got an email from the president this morning outlining the ways they are trying to cut expenses. They plan to slow the construction on a science complex and possibly scale back their plans, offer early retirement options, look for ways to streamline operations, but still keep tuition increases in check. It has been more than 35 years since Martin Cooper placed the first call on a mobile phone to his rival at Bell Labs while working at Motorola. [sic]In that time, phones have come a long way. Weblogg-ed » Facebook as Tipping Point? More and more I’m starting to think that Facebook may just be the engine that drives school change around technology. The numbers right now are pretty compelling. Six hundred thousand new users PER DAY, and fully three-quarters of the 175 million users are over 25. In fact, the fastest growing segment is women over 55. Whoda thunk that? Here's a great video explaining the credit crisis. Great use of visuals. I think this is a great way to begin a discussion in an economics class or other business class. Great article by Clive Thompson in the new issue of Wired (the paper version, so no link to the text right now) about the ways in which netbooks are changing the laptop landscape. And, at the same time, cementing the idea of cloud computing in our lives. Estimates are that netbooks will hold 12 percent of the world’s entire laptop market next year, which is amazing when you think that the Eee PC is less than two years old. And their adoption says a lot about how we think about our computers these days. Netbooks are evidence that we now know what personal computers are for. Which is to say, a pretty small list of things that are conducted almost entirely online…Netbooks prove that the “cloud” is no longer just hype. It is now reasonable to design computers that oursource the difficult work to someone else. The cloud tail is wagging the hardware dog. I’m looking at my almost two-year-old, dropped a dozen times, bent up MacBook Pro, thinking I’m going to need to replace it in the next few months and wondering should I go with a netbook. Better yet, should I go with like seven of them (or more) which is about many I could buy for the same cost as my Mac. Don’t get me wrong, I love my Mac. And I really want to do more video work using iMovie this year. But it would be really nice not to lug this thing around everywhere in my travels. In the 1980's the fax machine made snailmail almost obsolete. Faxing was faster. In the 1990's email made faxing almost obsolete. Email was faster. In the 2000's social media rose to challenge email's dominance. The blogosphere became the center of focus.Blogging about something was often a faster way to get attention (to oneself, or to the topic) than emailing people. And you could more easily reach a larger audience. In the 2010's it looks like Twitter (and other real-time messaging systems) may become more important than email and even blogging. Twitter is simply faster. And you can reach more people in less time, more interactively, in Twitter than via email.Twitter may overcome the asynchronous nature of the Web. Even search may go "real-time." Here's a video I recorded in December, with one of my wireless networking students - Doug Finch. Doug had just purchased a Blackberry Storm and was kind enough to provide us with a quick little review. I've since talked to a colleague in the business department you just bought a Storm - after seeing my iPhone ;). Her quick take: seems buggy, hangs and locks up a lot. She's very shy, but I'll try to get her on video. Hans Rosling - Yes They Can! Yes they can! says Hans Rosling about low and middle income countries that, with economic and health progress, are catching up with high income countries - countries we used to call the western world. Yes they can! from Gapminder Foundation on Vimeo. I worked from home on Friday and was able to catch this interview Marc Andreessen. If you didn't get a chance to watch, here the full video from Charlie Rose. This is really worth watching. Andreesen really has some great insights. In particular his thoughts on monetizing Facebook and YouTube. He observes that if you Facebook and YouTube wanted to make tons of money today, they could flip a switch and turn on traditional banner ads, but instead, both companies have adopted long-term growth strategies, rather than cash in in the short term. They are focused on building a business instead of making money. Andreesen says it much better - watch the video! Google's VP of Engineering, Vic Gundotra, showed both a new mobile version of Gmail running on the iPhone and HTC Magic today, as well as a new mobile version of Google Maps running on the Palm Pre. The new mobile Gmail app, which Gundotra demoed at the Mobile World Congress in Barcelona, makes extensive use of new features that are only available in HTML5. Among these new Gmail features were offline access, even in the browser, as well as support for labels. A little long - 90-minutes, but an interesting discussion between two authors, Mark Bauerlein and Neil Howe, on opposite sides of this question. Who knew CSPAN had this knd of stuff! The Millennials: The Dumbest Generation or the Next Great Generation? Mark Bauerlein and Neil Howe talk about the Millennial Generation and how it ranks compared to other generations. The two authors, who have opposing books on the subject, also talk about the influence of different technologies on the learning habits of those born between 1980 and 2000. This event was hosted by the American Enterprise Institute in Washington, DC. UPDATE: If you have difficulty getting the video to load, click on the red flash video button on the page linked to above. Here's a really neat service - www.tinychat.com - that allows you to create a disposable group chat. I've played with Windows 7 a bit - still have it on my Macbook in Parallels. It's definitely an improvement over Windows Vista, but I still end up using XP for anything Windows-related that I really have to do. I assumed, like many, that the improvements - Vista to 7, were an indication that Microsoft is starting to finally get usability and user experience. Unfortunately, this video seems to indicate that Redmond may not be as far along as I thought. If a little change like this is so cumbersome and difficult, we might as well sell everyone Linux boxes and have them do their configurations at the command line. Long-suffering Windows users hopeful that Windows 7 will make their lives easier shouldn’t watch the video below. In this ‘Quick Tip,” CNET executive editor Tom Merritt explains how to restore the Quick Launch Bar to the Taskbar in Windows 7. The Quick Launch Bar was a feature popular in previous versions of Windows. It’s nice that Microsoft allows users to recover such older-version features not switched on by default, but even the spaghetti-thinkers in Redmond could have come up with a better way to go about it. If this video is any indication of what changing settings in Windows 7 will be like, then Apple will need extra employees on hand in the weeks after the product’s launch to handle all the mobs of disaffected PC users. Below are 18 people I follow for a real time education. Please suggest your own Twitter professors in the comments. Why he’s my Prof: Like many of the Twitter Professors, he gives information freely for which others might charge an arm and a leg. He provides a daily heads up on what to look out for by analyzing real financial indicators. Because of @cspenn, I know to track the TED spread and the BDI and why. He also gives advice about online marketing. Oh, and he co-founded Podcamp. Why he’s my Prof: He really engages people on Twitter, which is admirable for an Editor-in-Chief at a national business magazine’s website. Sure he could have assigned some lackey intern to Twitter all day, but he didn’t. I’d expect nothing less from a self-professed “Digital Journalism Advocate.” I even know the important people he’s HAVING lunch with and what they are going to talk about. He asks for suggestions on questions to ask them. He doesn’t just tell you afterward that they ordered the bisque and it was a little cold. He also gave us a list of all the other BusinessWeek writers that Twitter, which is where I found @shirleybrady and @stevebaker. Why he’s my Prof: As the Senior Analyst in Social Computing at Forrester Research, @jowyang provides an endless stream of information about that voodoo that we do. Then he tried an experiment and purposely stopped Twittering for 20 days to refocus. Boy did I miss him. I learned that the world won’t blow up if I leave Twitter for 3 weeks, but if it did, I’d have to find out about it with everyone else in the world. He also cuts a mean run as a Salsa dancer. Why she’s my Prof: When I got my job at a nonprofit (@ALSofGNY) I dove right into Social Media as the primary way to connect with patients, families, caregivers and potential donors. I sought out others to learn how to do it better and @Kanter’s name came up. @Kanter imparts all her wisdom about how nonprofits can benefit from Social Media. Why she’s my Prof: Chris Brogan says about Ann: “She’s connected to LOTS of great people, so when I see who she’s talking about, I pursue and learn more.” Agreed. Ann has the coolest job title in the world as Chief Content Officer. She uses social media to share marketing resources with the crowds, and I’m here picking up the tidbits. Why he’s my Prof: If I left him off the list, I’d get phone calls. The man is always pushing a boundary of New Media whether it’s doing a paid post for Kmart as a trusted blogger and lighting up the blogosphere or telling you why you’re micro-famous, dammit and you’re special so go out and conquer the world, no charge for the moxie. He’s one of the biggest proponents of giving away value to get value that I know. RIM, Google, Microsoft, and now Nokia - all launching app stores. A great idea, but I don't think just launching an app store guarantees success. The iPhone app store is successful in part because it is tied to iTunes and because Apple has applied many of the lessons learned from the iTunes business model. The same phones will also debut two new services similar to those offered by rival Apple to users of its iPhone handsets: My Phone, to sync text messages, photos, video, contacts --but not email -- to the Web; and Windows Marketplace for Mobile, a new online application shop that will provide direct-to-phone mobile applications and can be accessed from both the phone and the Web. I too wish more funds had been allocated for broadband, but at least it's on the new administrations radar screen. Another concern is the administrators - I'm not sure what experience the NTIA and the Department of Agriculture have with broadband deployment. Really, the Department of Agriculture? I understand they deal with Rural Utilities Service, but isn't that water, power, etc? Also, I think it will be interesting to see the "national broadband plan" that the FCC produces as a result of this bill. I'm troubled that there isn't a plan already written. I hope these projects can ramp up fast enough to meet the two-year deadline, but with a plan to be written and administrators with questionable experience with broadband implementation, I can't help but be concerned! Congress voted 60-38 Friday night to approve the $787 billion economic stimulus package, and the final number for broadband stimulus funds is now $7.2 billion with the money to be split and directed toward projects benefiting underserved and rural markets. Tax credits for service providers are nixed. The National Telecommunications and Information Administration, overseen by the Department of Commerce, will distribute $4.7 billion, while the Department of Agriculture's Rural Utilities Service will deliver $2.5 billion. All broadband deployment projects under the NTIA program must be completed within two years of the award and must adhere to the Federal Communications Commission's Internet nondiscrimination and openness principles. Though there are no specific speed requirements, the NTIA is directed to promote projects that will "provide the greatest broadband speed possible." The bill also calls for the FCC to produce a "national broadband plan" that makes recommendations to Congress on how to ensure the universal adoption of affordable broadband services. The amount of money and the choice of administrators are among issues being criticized, but at this point all that remains to make the deal happen is President Obama's signature, which is expected early this week. I've been using GTD (at least my clumsy implementation of it) for a few years and have been mindmapping even longer. Some of my best presentations were first mindmapped. I've also been using online mindmapping app Mindmeister quite a bit lately. It's imports MindManager maps, allows online collaborative mapping, and uses Google's gears to provide offline functionality. Combining the GTD approach with Mindmapping seems like a marriage made in heaven. Learn how to use mindmaps to implement "Getting Things Done" (GTD) by David Allen using free collaborative mindmapping tools. go to the room where you will give your presentation to get a feel for the set-up. practice in front of a friend or friends without stopping, just as you will want to give your presentation on speech day. practice in front of a mirror (full length if possible). practice using your visuals so you know how much time they will take up and how to incorporate them into your speech. practice with background noise (ie.- turn on the tv, radio, etc.) in order to practice with distractions. practice with the actual speaking outline you will use in your presentation. practice your speech dressed as you plan to be for your actual presentation so that you can feel comfortable and ready to speak. time yourself. Make sure you are consistently within your time frame. video tape yourself if possible. This is the best way for you to see what needs to be adjusted before you give your presentation. be aware of your posture and mannerisms. If you are going to use movement on speech day—you need to practice; keep it controlled and natural. eliminate distracting mannerisms such as playing with jewelry, tucking hair behind your ear, playing with a pen, etc. You can eliminate such mannerisms if you are aware of them. wear a hat, unless it is part of your presentation. Dress appropriately any time you give a presentation. Make a credible first impression by looking like you there to give a good speech. use distracting mannerisms. This includes nervous habits you have (i.e. playing with a ring or necklace, tucking hair behind your ear, playing with a pen, etc.). These are actions you can easily avoid doing if you are aware of them. stand with your arms crossed or your hands in your pockets. This type of posture prevents you from gesturing and may even make your audience uncomfortable. apologize if you make a mistake; correct the mistake and move on. Chances are most people will miss it anyway. make faces when you make a mistake it is better to just keep going. put visual aids up in front of the class before you explain them. Introduce them as you are speaking. Take the visuals away after you are done with them. Put cues on your outline to remind you. hold your outline while practicing your speech. Put your outline on something: a music stand; a box; a counter, anything to simulate the lectern. developing student data systems that enable crucial tracking of outcomes. ... the federal government should double its current level of direct support for community colleges, from $6 billion to $12 billion, in order to account for 30 percent of their budgets. Resource needs, especially for infrastructure, technology, and faculty, are significant and pressing. the recovery package—and future federal higher education policy—must do more to help transform America’s community colleges. Faced with high tuition costs, a weak economy, and increased competition for admission to four-year colleges, students today are more likely than at any other point in history to attend one of the nation’s 1,100 community colleges. Annually, community college enrollment is increasing at more than twice the rate of that at four-year colleges, by 2.3 million students in the first half of this decade alone. The rise of these institutions reflects their important roles in training workers, especially first-generation college students, for well-paying, high-demand jobs and in providing students a bridge to even higher levels of education. We need to get more out of the system, however. Columbia University researchers estimate that the community college dropout rate is 50 percent. Despite the fact that community college degree and certificate holders earn considerably more than workers with only a high school diploma, just one-third of students who entered a community college in 1995 completed a degree of any kind by 2001. With many of the fastest-growing occupations requiring some post-secondary education, but not necessarily a bachelor’s degree, serious challenges await if community college performance does not improve. Part of the problem lies in the way we fund community colleges. Owing to their historical role in serving local labor markets, community colleges are hampered by a heavy financial dependence on states and localities, where negative budget outlooks today portend deep funding cuts. Moreover, they are funded primarily based on enrollment, without regard to whether their students earn degrees or get good jobs. This gears community colleges' incentives toward inputs and process, rather than outcomes like student success. Given the critical function of community colleges for meeting our nation’s future economic needs, the federal government has a responsibility to improve this state of affairs. Its current role is limited; community colleges receive less than 30 percent the level of federal government support provided to four-year colleges. A forthcoming paper from the Brookings Institution proposes a major shift in this relationship. It calls for four key federal reforms: a new focus on national goals for the two-year sector guided by a first-ever accountability system; expanded federal funding to help community colleges meet these more ambitious goals; stimulating greater innovation in community college policies and practices to enhance educational quality; and developing student data systems that enable crucial tracking of outcomes. As recognized by ambitious initiatives such as the Lumina Foundation’s Achieving the Dream project, a “culture of evidence” focused on student achievement—when coupled with capacity-building efforts to make success possible— can have a rapid and transformative impact. On funding, the federal government should double its current level of direct support for community colleges, from $6 billion to $12 billion, in order to account for 30 percent of their budgets. Resource needs, especially for infrastructure, technology, and faculty, are significant and pressing. Since 1974, only 149 new community colleges have been built, and many campuses today are bursting at the seams. While community college students tend to enroll part-time, even these students require space in which to learn. In the first two years, this spending would amount to just 1.4 percent of the proposed costs of the recovery package, and would support infrastructure upgrades that truly stimulate the economy. Over the longer term, it would add modestly to federal higher education expenditures, but would ensure that our nation realizes an economic payoff from increasing enrollments. The federal government should not simply expand funding, but use these new resources explicitly to promote greater success for community college students. Colleges receiving enhanced funds would be required to track and report student results, such as completion of a minimum number of credits, earning a degree, and landing a good-paying job. Over time, a majority of federal dollars would be awarded based not on enrollment, but on colleges’ performance on these critical measures. Our community college system, long on the sidelines in funding and policy debates, now needs a seat at the table. Ensuring that American workers are trained to compete in the global marketplace, to earn a place in the middle class, and to fulfill their responsibilities as citizens requires expanding and improving their experience with postsecondary education. By better supporting the affordable and accessible higher educational institutions found within all of our communities, and asking more of them in exchange, we can put our nation and its families back on the path to economic prosperity. Despite the fact that the economy is shedding half a million jobs per month, the “moderate” approach to stimulus in Congress appears to involve rejecting aid to state and local governments and thus ensuring pro-cyclical cuts in public employment. As a result, education budgets are sure to suffer, and there’s a strong case that no institutions are more vulnerable than community colleges, which get short-changed in the public budgeting process when times are good and don’t have endowments and other diverse revenue streams to fall back on now. With crumbling, outdated facilities, many community colleges are ill-equipped to handle the surge of new students who will arrive seeking refuge and retraining as job losses mount. Mid-career workers with families facing sudden, unexpected unemployment aren’t going to enroll full time in their state’s four-year residential flagship university, which probably wouldn’t admit them in the first place. Yet the unbalanced power dynamic in most states is such that economically well-off students in the flagships will get more protection, even though they’re already receiving far more public support than their less advantaged peers in public two-year institutions. Something good is bound to happen—if there’s no need to fix a mechanical problem or resolve a room conflict, you can always mingle with the audience. What the problem is, who cares, and what your solution is. --Notes on the stumble-bum technique (a high-risk approach): Tufte described a talk given by a humble high school math teacher to a lecture hall full of mathematics professors. On his first slide, the math teacher had a simple proof, with an error on the third line. Naturally, the professors leaned forward in their chairs to point out the flaw. For the rest of the presentation, the audience hung on every word, waiting for the next slip. Of course, there was no slip. Caution: if you use this technique, you had better know your stuff. --Write out your own introduction. Most people wouldn’t have noticed the issues for which you’re apologizing—and it just sounds lame. Give a particular specific example, then a general overview, followed by a repeat of the particular to reinforce the point. --Text on paper can provide more information than verbal communication (e.g. it takes 22 minutes to read the top half of the New York Times aloud). --This allows them to become engaged. --Assures that each point is covered (even if you forget something). Audiences don’t suddenly become dumber when they sit down to hear you speak—no reason to "dumb down" anything! It’s preferable to leave humor out if you risk alienating anyone—let alone the possibility of not being funny. Even though it may not always be grammatically correct, you should say "they" instead of "him or her" and it will sound better—both because it’s shorter and because no one can be alienated. Why risk not communicating simply because someone may be sensitive? --People’s opinion may be based more on how you answer their question than on how you present. People are often really saying "What about me?" when they ask a question. --Right after you call for questions, count to 10 before assuming no one will ask. --To assure questions are asked, plant a person in the audience and give them a question. This also gets others motivated. Tufte refers to it as "a trapezoid strip show" because the shape of the projected image is distorted, and people often use the technique of revealing only one line of the image at a time. Two other problems are that you have to turn off the lights (some people will fall asleep) and overheads only provide a fraction of information that can fit on a handout. Don't hide behind a lectern. Use gestures. Walk around, directly engaging the audience. You never hear someone say "I really wish they had talked on and on for another 10 minutes." --Prepare and practice for a critical audience. --Practice in front of a video camera to spot flaws, mannerisms, and idiosyncrasies. --In addition to using notes for content, make "metanotes" reminding you to use techniques; like making eye contact, not to mumble, not to keep sipping the water. If you’re flying to a presentation this is particularly important as air travel really dehydrates you. And never drink alcohol. Or an episode of punk'd? The BBC set up a video camera in front of the icy steps at Waterloo Station, and taped people slipping and falling. Students, parents, prospective students, etc can check to see if I'm online and available. If I'm available, the little dot next to "Chat with Michael Qaissaunee" is green, if I'm away or unavailable, the dot is grayed out. Pretty cool! I've had students ask me questions after class, before class, even at 11 pm. It's a communication medium they're very comfortable with. I've blacked out the student's name, to protect their privacy. Notice that the student comes up as "Guest" - I've told them in class that they have to identify themselves and the class. By default the chat session is not logged or recorded. Lastly, I do have the ability to make myself invisible, if I'm working on something else or it's too late at night. The Pelosi graph has now been supplemented by Justin Fox's and William Polley's. I reproduce the more complete one. I note that even Martin Wolf says this won't be as bad as the 1930s. The decline started more shallowly than others but is heading vertically down at this point. Still, others have been worse, and the 2001 recession was shallower but far more extended than previous ones. One cannot predict the future, but one recalls that many recessions begin before we realize it and end the same way. Several people have asked why I switched from the iPhone to a G1 running Android. My reasons are both practical and philosophical. Android lets me manage my contacts in one place: Gmail, and syncs them automatically to my phone. No more local address book! Android is better than the iPhone software in a few ways: it’s way more customizable, it offers copy and paste, the pull-down ‘window shade’ is a better notification mechanism, and in general it gives you that feeling that you’re in control of every setting. Android doesn’t run Safari, but it will likely run Chrome someday. I love the trackball on the G1 for scrolling and clicking. From an economy-of-motion standpoint, it’s a way more efficient way to interact with the device than swiping and tapping the screen. The snap-out keyboard is sweet, too. Android’s apps are written in Java, and as a Java developer, this delights me. Android doesn’t tie me to iTunes, which is a fine piece of software, but is just a little too bossy and proprietary-like for my taste. Obviously, your mileage may vary. But there is a misconception that the iPhone is a superior smartphone, and that’s not necessarily true. What’s true: The iPhone software has been out longer than Android, so it may be more fully-baked (though apps and Safari crash on my iPhone regularly, more so in the 2.0 ‘upgrade’). The iPhone has a much larger market share. There are probably more apps for the iPhone than for Android, but the Android Market is well-stocked, and I have had little trouble finding the stuff I need. The only iPhone thing I truly miss is its built-in visual voicemail, but I’ve installed PF Voicemail+ on Android to get that same functionality. Not being a heavy voicemail user, this isn’t that big of a deal to me (though it may be for you). Update: I also miss the excellent Evernote iPhone app, and have my fingers crossed in hope an Evernote equivalent will happen soon (or at least a mobile Evernote site that works well in a mobile browser). Question: Are you concerned about the number of students who have forsaken engineering for business school? Answer: They’ll go back to being engineers after they’ve discovered that business school doesn’t make them millions of dollars. They’ll see the stock market doesn’t do them much good, so they might as well do something constructive. So just what’s new and different? We’ll take you through the highlights below. The new controls are better designed. Instead of a weird slider on the right-hand side that’s used to move from line to line, there’s a new 5-way joystick. The keyboard is also no longer split into two regions like those funky desktop keyboards you see at Fry’s but never buy. There’s been no price drop It still costs roughly the same amount ($359) but at least there’s still no monthly wireless fee for downloading books, magazines, etc. Anyone who reads this blog on a regular basis - all eight of you ;) - knows what a big fan I am of the annual TED conference. Held every spring, TED is a great opportunity to see bite-sized presentations and demonstrations showcasing new ideas and new technologies. In fact, it was a TED video where I first saw Jeff Hahn demoing his multi-touch re-purposed drafting board. Now multi-touch is mainstream. Unfortunately, TED is by invitation only, so you and I will never get to be there live. The solution has been to watch video of the event after the fact - until this year. 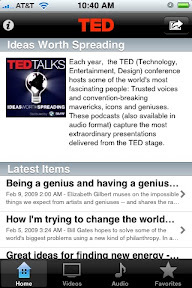 This year, the producers of TED have created a free iphone app to allow users to read stories, listen to audio, and watch video from the conference. A great step forward! If you're hosting or organizing a conference, you should seriously consider creating an iPhone app to connect with your attendees and those unable to attend. With travel budgets getting cut everywhere, the ability to connect with the community is even more important! Do You Make Money from the Internet? For two years I was obsessed with trying to turn a blog into a business. I posted 10 or 20 items a day to my site, The Secret Diary of Steve Jobs, rarely taking a break. I blogged from cabs, using my BlackBerry. I blogged in the middle of the night, having awakened with an idea. I rationalized this insane behavior by telling myself that at the end of this rainbow I would find a huge pot of gold. But reality kept interfering with this fantasy. My first epiphany occurred in August 2007, when The New York Times ran a story revealing my identity, which until then I'd kept secret. On that day more than 500,000 people hit my site—by far the biggest day I'd ever had—and through Google's AdSense program I earned about a hundred bucks. Over the course of that entire month, in which my site was visited by 1.5 million people, I earned a whopping total of $1,039.81. Soon after this I struck an advertising deal that paid better wages. But I never made enough to quit my day job. How Do We Measure the Quality of a College or University? That's an interesting question. Clearly there are lot's of metrics we use to gauge the performance of institutions of higher ed. As this Kevin Carey post inThe Quick and the Ed blog points out, one of the most common measures of quality is the SAT scores of incoming freshmen - a criterion that wouldn't even apply to open-enrollment colleges such as mine. The post elaborates on the flaws inherent in the SAT metric - most glaringly, how does a college get credit for a test score from a students junior year in high school? So the question becomes - "How do you actually measure the performance of a college?" Although not a definitive answer, Carey argues that perhaps growth, as measured by freshmen versus senior differentials on standardized tests, such as the Collegiate Learning Assessment, would serve as a better indicator of a college's performance. It's interesting that I see this same dynamic in my classroom. Of course there are the students that will ace every assignment, quiz and test - the perennial A-students. For other students, one of the indicators I am always looking for is growth - students who may not have started with the best test scores, but keep working hard and show that growth or improvement over the course of the semester. Sometimes it is working with these students that provides a faculty member with the greatest satisfaction. The Austin and Dallas campuses are getting students at 1200 and above while the non-selective regional campuses like Pan American and Permian Basin are below 1000. This conforms with nearly any measure of prestige and status one could name: Austin is an internationally known, Research I, AAU institution with a multi-billion dollar endowment and a football team that was lucky enough to beat my Ohio State Buckeyes in the Fiesta Bowl last month, not that I'm bitter. (Although: 'Colt McCoy'? Really?) Permian Basin has none of these things, and probably never will. Each block on the graph shows two data points: freshman and senior scores on the CLA. As you'd expect, freshman scores correspond fairly closely with SAT scores: Austin and Dallas have the highest, regionals like Permian Basin the lowest, and the rest are in between. Much more interesting is growth. While Austin students arrive at high levels, they don't seem to improve very much while they're in college--the difference of 53 points is less than half the national average of 111 points. This may because of some sort of 'ceiling effect,' or it may be that elite universities don't focus much on improving students who arrive in great shape to begin with. Pan American and Permian Basin have very similar freshman scores, but Permian Basin's growth is more the double that of UTPA -- 197 to 90, bringing students from well below the national average on entry to above it on completion. Verizon's BlackBerry Storm is getting a little kick in its pricing courtesy of an Amazon rebate-free rebate. The deal here is that the infamous touchscreen BlackBerry is now $99.99 on a two-year stint, no rebate paperwork, no mailing things anywhere, just shell out cash, get phone, call people. Verizon has a buy one get one free thing going on right now, so if you're looking for two Storms for the price of one -- and that one is still $199 -- you can head on over to see them.